A propane double tanker truck lost control and turned over at a freeway entrance/exit near my home around 3:00 in the morning. The emergency response teams evacuated people from nearby homes and businesses, including a nursery school, and then cordoned off two blocks on either side of the freeway. Oddly, they allowed traffic to continue flowing on the overpass right above the truck. I didn’t realize any of this was going on until I tried to drive somewhere and couldn’t get on the freeway. I figured out another route, did my errands, and when I got home walked down to the scene with my sketchbook, paints and stool. 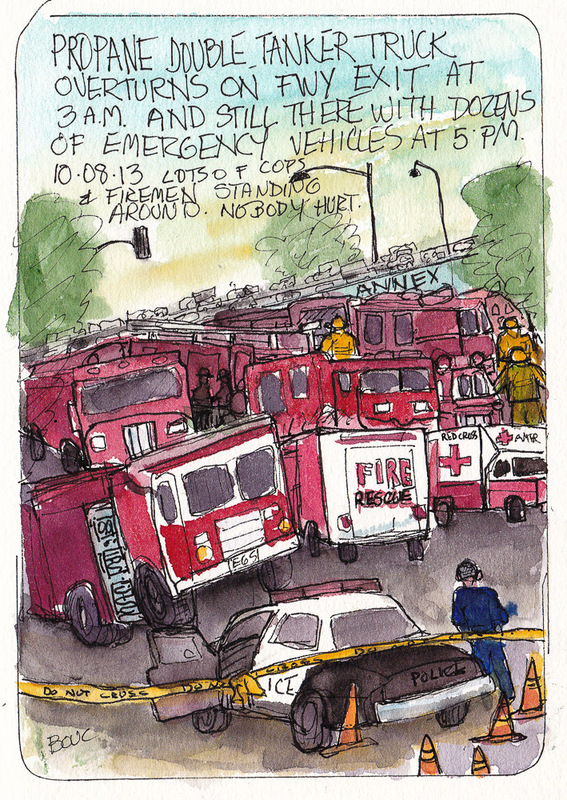 When I finished my sketch and headed home at 5:00 p.m. the fleet of emergency vehicles (including police, fire, utilities, and the Red Cross) and the small army of responders were just beginning to leave. Some of the evacuated residents were sitting on the curb, still waiting to be allowed back home. Fortunately nobody was hurt and the propane tanker didn’t leak. I’m so glad I live outside the evacuation area; I don’t know where I would have gone at 3:00 in the morning! You certainly can pack a lot into 7 X 5. Very impressive accounting of the moment! I love how you’ve captured the scene. I just focus on details and can never get the atmosphere you do.